Welcome one and all to the greatest show on Earth! Inside the big top we have such mysteries as you've never seen before! A three-ring extravaganza of conspiracies, UFOs, the paranormal and much, much, MORE! So sit back and relax and prepared to be amazed, because Conspiracy Journal is here once again for your viewing pleasure. Russian prosecutors will travel to the Dyatlov Pass in the Ural Mountains in March to relaunch the investigation into the unsolved deaths of nine hikers who perished on the mountain 60 years, Alexander Kurennoy, the spokesman of the Russian Prosecutor General's Office, said on Friday. According to Kurennoy, the prosecutors decided to restart the investigation into the incident, which took place between February 1-2, 1959, due to requests from relatives of the victims. Investigators also took into consideration the continued interest in the incident expressed by both the media and the public. "Between March 10-20, employees of the Sverdlovsk Region Prosecutor's Office will fly to the site of the incident together with geodesy experts and employees of the Emergencies Ministry," Kurennoy said, as broadcast by video service Efir. He specified that only prosecutors were authorized to carry out an investigation into such an old case. "The procedural deadlines have expired for all the other competent bodies, but this is not the case with prosecution agencies. Apart from that, a new law has come into force that authorizes the prosecution to commission special expert evaluations as part of a probe," Kurennoy said. He added that the prosecutors had already carried out preparations for the probe, which included an analysis of the over 400-page criminal case. The mysterious accident took place in February 1959, when a group of Soviet tourists, made up mostly of students and graduates from the Ural Polytechnic Institute a few hundred miles away in Yekaterinburg (then called Sverdlovsk), set out on January 27 to reach the mountain Gora Otorten. After being sidetracked by a snowstorm, they pitched a tent on the eastern slope of Kholat Syakhl on February 2. That night they died. Apart from the fact that they froze to death, no one knows why. Police and military investigators charged with solving the case were baffled by what they found. The skiers’ tent had been sliced open from the inside and hurriedly abandoned. Their belongings were still inside, but the skiers weren’t. The placement and condition of their bodies, some found as far as a kilometer-and-a-half (almost a mile) from the tent and buried under four meters (13 feet) of snow, were odd — to say the least. Investigators found footprints in the snow of eight or nine people who were wearing socks, a single shoe or were barefoot. The footsteps led towards a dense forest but disappeared after 500 metres. The first two bodies, of two men, barefoot and dressed only in their underclothes, were found at the edge of the forest near the remains of a fire. 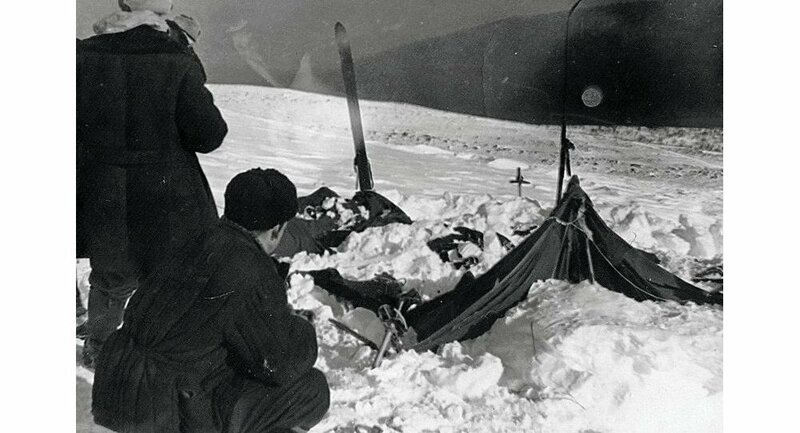 The next three bodies — of [expedition leader Igor] Dyatlov and another man and a woman — were found between the fire and the tent, suggesting that they had been trying to return to the tent. Autopsies failed to find any evidence of foul play. An inquest concluded that all five had died of hypothermia. Two months later, however, the partially-dressed bodies of the other four members of the team were discovered in a forest ravine, not far from the first two bodies. They appeared to have suffered traumatic pressure or crush injuries. Even more bizarre, autopsy reports showed that Lyudmila Alexandrovna Dubinina had her tongue ripped out and was also missing some soft tissue around her eyes, eyebrows, nose bridge, upper lip, and cheek bone — not to mention the eyes themselves. Tests conducted on their bodies and clothing showed small traces of radiation. A researcher in Russia believes that he has discovered a critical clue to the Dyatlov Pass mystery. The infamous 1959 incident saw nine hikers perish in the Ural Mountains under suspicious circumstances that have never been fully explained. 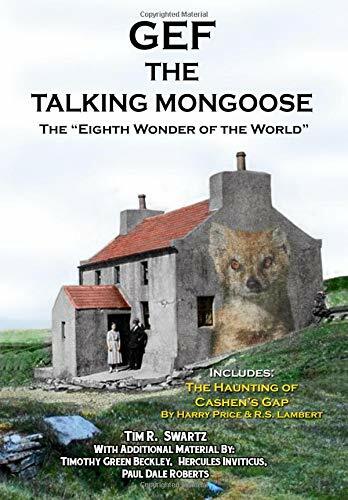 In the ensuing years, numerous theories have been offered, ranging from the prosaic, such as an avalanche, to the fantastic, including suggestions of a Yeti attack. One explanation which has garnered a fair amount of support among conspiratorial researchers is that the group inadvertently fell victim to a clandestine Russian weapons test. This theory appears to be bolstered by what is being heralded as a new discovery near the site of the incident. Longtime Dyatlov Pass investigator Valentin Degterev reportedly claims to have found evidence, by way of Google Earth, of an impact crater measuring nearly 100 feet in diameter and less than two miles from where the hikers met their doom. Based on historical reports that the clothes of some of the dead tested positive for radioactivity, the researcher speculates that their untimely end was due to a mishap involving a nuclear rocket. Degterev hopes to journey to the crater in the spring of 2019 for an on-site examination of the spot to see if it bears signs of being created by a blast. Until new evidence comes forward, the bizarre incident on that snowy mountain remains a mystery. The project searching for possible DNA-evidence in favour of or against the existence of the famous Monster “Nessie” in Scotlands likewise famous Loch Ness has delayed the publication of its results that were announced previously to be published in late January. Since last summer, a team of scientists lead by Prof. Neil Gemmell of the University of Otago is trying to genetically test theories surrounding a still unknown large creature lurking in Scotland’s most famous Lake Loch Ness. Using so-called eDNA, the researchers want to search for clear genetic traces of an organism that would explain – or refute – countless sightings of the legendary “Loch Ness monster” Nessie. Using water samples from Scotland’s second largest freshwater lake and comparative control samples from three other Scottish lochs (Loch Garry, Oich and Morar), the biologists hope to search for genetic traces of the alleged monster “Nessie” in Loch Ness using so-called environmental DNA (environmental DNA). eDNA represents a comparatively new method of DNA analysis that can extract even the smallest traces of DNA from environmental samples such as water or soils. The method became known through the DNA-evidence of the existence of the ancient so-called Denisova humans from the analysis of deposits in a cave in which no other physical evidence or traces were found for the former presence of the long unknown early human species. „After sample collection was completed in June, a global team of scientists has been busy extracting DNA, sequencing genes, and sifting through international DNA databases to identify forms of life present in the famous loch. It was previously hoped the results would be available early this year, however, the analysis has taken longer than anticipated. Of course this is just speculation, but perhaps the delay is because the analysis has already found unknown DNA in Loch Ness. If this is the case, more than likely the team is now scrambling to either come up with a proper press release for such a mind-blowing revelation, or concocting some sort of misdirection to cover-up the fact that something(s) currently unknown is living in the dark depths of Loch Ness. Was Bigfoot Spotted in Provo, Utah? PROVO, Utah – Whether Bigfoot is real or not is more a question of faith than science. Case in point, the latest sighting in Provo, Utah. The incident happened in January, and of course, there is video. Craig later posted a follow-up video where he and his friends hiked up to the area they saw the figure. The conclusion they came to was that the dark figure they saw was a tall hiker. However, there was also a comment from someone on the ground about how much smaller Craig and his friend looked than the thing in the Bigfoot video, but again, perspectives are tough to judge and the “hugeness” was speculation. Later, a member of the Rocky Mountain Sasquatch Organization posted their own video while they investigated the area. They thought that Austin didn’t quite find the correct location in his investigation video. This investigator believes he found Sasquatch tracks in the same location where Austin Craig originally saw the dark figure. Loch Ness, Scotland has a reputation for high-strangeness. It dates back not just to relatively recent times, but centuries ago, even. There is, for example, the 565 AD affair of St. Columba, who allegedly saw a strange creature in the waters of the River Ness, which flows from the huge loch. More than a thousand years later, there was a deep belief in the area that the waters of Loch Ness were home to what became known as “water horses” or “kelpies.” They were dangerous and deadly shapeshifters. From 1899 to 1913, the “Great Beast” himself, Aleister Crowley, had a home at Loch Ness: Boleskine House. In 1933, the phenomenon of “the Loch Ness Monster” took off big time. In the 1970s, Nessie seeker Ted Holiday had an encounter at the loch with a Man in Black. In other words, Loch Ness is definitively weird. More Loch Ness weirdness hit the news in 2011, specifically in August of that year. The UK’s Daily Express newspaper splashed a headline across its pages that read: “Alert as UFO is sighted over Loch Ness.” The story was, undoubtedly, an odd one. That something occurred does not appear to be in doubt. It is, however, the nature of the “something” that remains open to debate. It was on the night of August 20, 2011 that a number of people –many being completely independent of each other – encountered something unusual in the skies over Loch Ness. Witness descriptions of the movements of the object fell into two camps: those who said they saw it descending into the loch and those who maintained it was actually hovering above the expansive waters. As for the appearance of the UFO, it very much depended on who one asked. But, whatever it was, it quickly caught the attention of the emergency services, who were contacted by worried locals. Martin Douglas, of the Loch Ness Life Boat crew, told the Daily Mail that someone in the area had seen what, superficially at least, resembled a microlight or a hang-glider, and which actually seemed to enter the loch in a controlled flight. Oddly, however, others who saw the unknown craft described it as being somewhat balloon-shaped. Then there were those who opined it looked eerily like a fully-open parachute. There was, then, no real, solid consensus on what was seen – or on what wasn’t seen. Crew member Vivian Bailey added that although the mystery was not resolved, the emergency services were pleased that concerned people had quickly contacted them. There is, however, a very odd afterword to all this. Exactly one month previously, on July 21, law enforcement offices in the vicinity of 125-miles-long Lake Champlain – which covers parts of New York and Vermont, and portions of Quebec, Canada – were inundated with calls from worried locals, all who had seen a balloon-like object fall into the huge lake, near Rouses Point, New York. Police and Border Patrol personnel were quickly dispatched and scoured the area, but with no luck. After around four hours, the search was called off. It remained a mystery. It should be noted, however, that, just like Loch Ness, Lake Champlain has its own resident monster. Champ – as the creature is famously known – is, like Nessie, a large, long-necked leviathan that has taken on near-legendary proportions. Is it only coincidence that two lakes on opposite sides of the world – both with resident monsters – should have been the sites of unusual, and very similar, UFO-like activity within a month of each other? Or is this yet further evidence of profound paranormal weirdness wherever lake monsters lurk? Throughout history, hundreds — sometimes thousands — of people have been spontaneously compelled to dance until collapsing or dying from exhaustion. What explanations are there for this bizarre phenomenon? In 1518, Strasbourg, 400 men and women danced until collapsing from exhaustion. These "dancing plagues" occurred throughout the Middle Ages. Similar spontaneous, mass compulsions have occurred throughout history, some very recently. What are they, and why do they happen? On a July day in 1518, a woman named Frau Troffea began to dance in the streets of Strasbourg, part of the Holy Roman Empire in modern-day France. There wasn't all that much to do for entertainment in medieval Strasbourg, so this diversion was met with enthusiasm by passers-by. Frau Troffea was spinning, twisting, jumping, all without music. It was entertaining to watch, until it wasn't. Six days later, Frau Troffea was still going. She hadn't slept or eaten. Day or night, rain or shine, Frau Troffea couldn't stop dancing. This alone would have been cause for alarm, but suddenly people began to join her in her relentless dance. At first it was a crowd of 34. Then, by the end of the month, it was 400. People began to drop like flies, overwhelmed by the constant exhaustion. The lucky ones merely lost consciousness, snapping themselves out of their strange affliction. The less fortunate died of heart attacks. In the hopes of wearing the dancers out, the Strasbourg city council decided to build a stage and hire musicians. Their theory was that the dancers had fevers, "hot blood" that could only be cured by dancing it out. This was obviously a terrible idea: the performance merely encouraged more citizens to join the crazed dancers. At its height, some sources claim the dancing was killing up to 15 people per day, and it seemed like it would go on forever. It was terrifying, until it wasn't; one day, the worst-afflicted dancers were taken away to a shrine, where they eventually stopped dancing. Without them, the remaining dancers slowly stopped as well. That the "dancing plague" of 1518 occurred is certain. Numerous historical documents from various sources confirm that, indeed, hundreds of Strasbourgeoise began to uncontrollably dance—doctor's notes, church sermons, notes from the city council, and other texts all confirm similar details. What isn't clear is what caused this to happen. Ergot poisoning is one culprit: The fungi grows on rye and, when baked into bread and consumed, acts very similarly to LSD, albeit deadlier. Although ergot poisoning does produce psychoactive effects, it's far more likely to kill its victims than to give them the stamina to dance for a month straight. Rather than attribute the dancing plague to one easily understood culprit, other scholars assert that it belongs to a class of poorly understood psychological phenomena called mass psychogenic illnesses — more commonly known as mass hysteria. The people of Strasbourg and its environs were […] experiencing acute distress in 1518, after a succession of appalling harvests, the highest grain prices for over a generation, the advent of syphilis, and the recurrence of such old killers as leprosy and the plague. Even by the gruelling standards of the Middle Ages, these were bitterly harsh years for the people of Alsace. 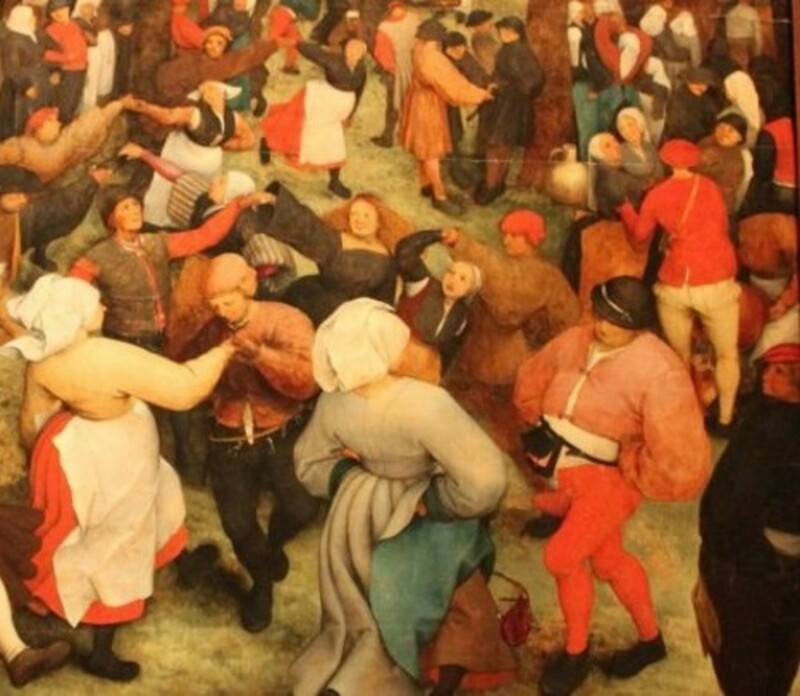 Although the dancing plague of 1518 was striking in its character, it wasn't the only dancing plague, nor the only instance of mass psychogenic illness. Just like an instance of a dancing plague itself, the series of dancing plagues seemed to start for no reason and end for no reason. Between the 13th and 17th century, medieval communities were repeatedly compelled to dance. In 1374, thousands of villagers along the Rhine river fell into a dancing mania, screaming in agony as they went along. In 1237, a group of children from German city of Erfurt leapt and danced 20 kilometers (12 miles) to the neighboring town of Arnstadt before collapsing in exhaustion. Mass psychogenic illnesses have taken many forms over the years. Between the 15th and 19th centuries, nuns from disparate nunneries would climb trees and meow like cats, bark like dogs, imitate lewd sexual behavior, and generally act as though they were possessed. Even in Salem, young girls fell into strange "fits" that spurred on the witch trials, which some have interpreted as mass psychogenic illness. Although dancing plagues seemed to have ceased with the close of the Middle Ages, mass psychogenic illnesses have occurred throughout history. In 1962, around 1,000 Tanzanians began to laugh uncontrollably, sometimes for up to 16 days at a time. The epidemic only ended 18 months later. In 1983, close to 1,000 Palestinians began to faint and feel dizzy. They blamed some kind of Israeli chemical warfare, but the nature of the affliction and its spread throughout the populace forced investigators to conclude that had a chemical attack occurred, it could only have caused 20 percent of the reported cases. The trouble with mass psychogenic illnesses is that they occur too rarely to observe in the field, and there's no way to predict when they will. What causes them and what makes them go away are complete unknowns. At the very least, they underscore how profoundly incomplete our understanding of human psychology is.